This drink is very simple & easy to make, but tastes oh-sinfully-good! I name it Choco Kahlua and it's is just the perfect beverage to chill with on a warm evening, like the past few days have been. How does it taste like? Alcoholic (just a teeny bit though! ), chocolate-y, but very light, with a whiff of coffee aroma from the Kahlua. 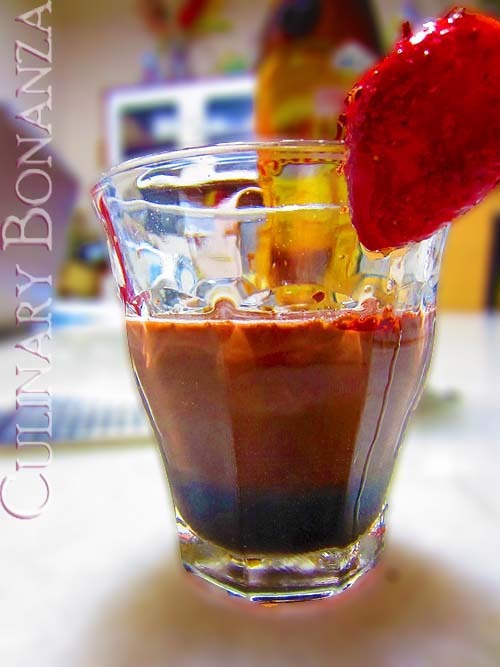 If you have had Chocolate Martinis elsewhere, this drink is the closest home-made version of it. And guess what? you only need 4 ingredients to make this concoction: Cocoa powder, milk, Kahlua liquor and a block of chocolate. Add about 3 tsp of cocoa powder into 100ml of hot water. Mix well. Add milk, just enough to slightly lighten the colour of the liquid chocolate. Stir well. Now, add the Kahlua as much as desired. Use a spoon to aid when pouring, so you can achieve the double layer effect. With a grater, shave the chocolate block on top. I'd recommend using dark chocolate (70% is best), as you won't want your drink to have oily layer on top. Top it off with a few ice cubes (hence: on the rocks) and a strawberry for sweet finishing touch.